We're getting a new channel. It will be called "Trek" and will replace a channel called "Escales." However, we did not subscribe to "Escales" so I don't think we'll be getting "Trek." Both are like travel channels, but "Trek" will be more about adventure travel, like mountain climbing and throwing oneself off of high places. I"m not likely to be doing any of that. We already get a travel channel called "Voyages" which is more my speed. Mila Kunis has a new Sci-Fi movie in theaters. I still think of her as Jackie in "That 70s Show." Age of Extinction. An American made-for-tv movie directed by James Kondelik. 2014. First showing. With Kelly Hu, Robert Picardo, Nick Stellate, Nicholas Alexander, Anthony Marks, and Lane Townsend. The sun strikes an altar hidden inside an ancient pyramid and initiates an alien invasion. An anthropologist tries to stop it. ► Kelly Hu's charm is not enough to save this low-budget, poorly written stinker. For adults, teenagers over 12 years. Note: My translation is not word-for-word; I'm trying to express the sentiment as an American reviewer might. We had some snow on Friday. And by snow, I mean flurries mixed with rain for all of about five minutes. It goes without saying that none of it stuck to the ground. Now they're predicting snow for most of the next week, but it will likely be the same story. Still, we're back to wintery temperatures. Thursday was a wet day, to say the least. It had started raining during the night and did not stop all day. The rain was moderate, but steady. It's unusual for us to have hour after hour of steady rain. Normally our weather systems come in with squalls or showers that move quickly through, but this system was just rain, rain, rain. We measured twenty millimeters in the gauge this morning. 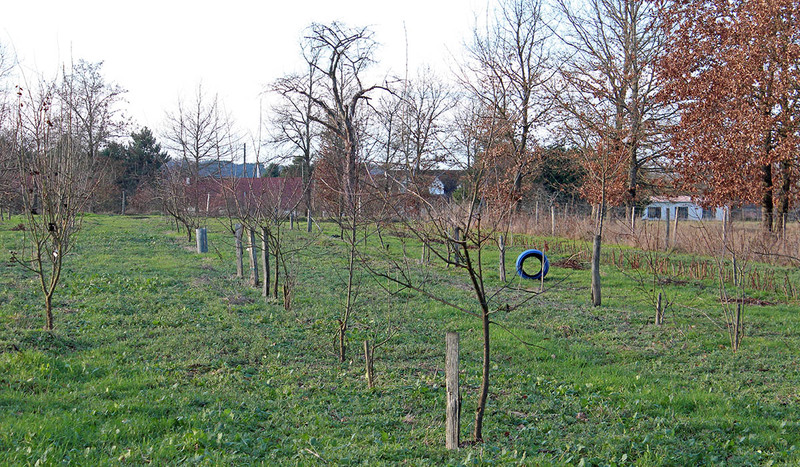 This small orchard was planted sometime in the last five years or so. The rain has stopped now, but the temperatures have dropped and the wind is still with us. Ah, the joys of winter. This is a section of the walk that Callie and I usually do in the afternoons. The river is not far from here, but we have to cross the road to get there and cars tend to fly by, so it's not something we do often. And this time of year the ground is very wet and it's no fun trudging along the muddy riverbank with the dog. 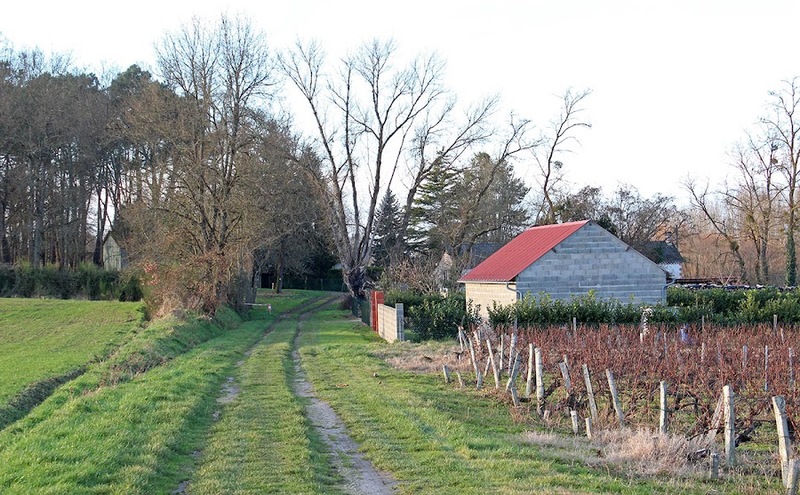 A wheat field on the left and a small vineyard parcel on the right. There aren't many vines in the valley; most are up on the heights where drainage is better. Wednesday afternoon was rainy and windy, so we did not venture down on this route. Rather, we stayed close to the house and took a shorter walk. Today's weather is much the same: rainy and windy. This morning's walk will be short and muddy. This is our take on the classic pissaladière (onion pizza). The only real difference here is that I've left out the anchovies. The last time I made one, Ken said that he didn't really like the anchovies, and I agreed. I think we had a particularly strong batch and it was too much. I have made the pissaladière with anchovies in the past and it was good. At any rate, leaving them out is ok if you don't like them. The second of two small pizzas. Delicious! Otherwise, it's a simple pizza. 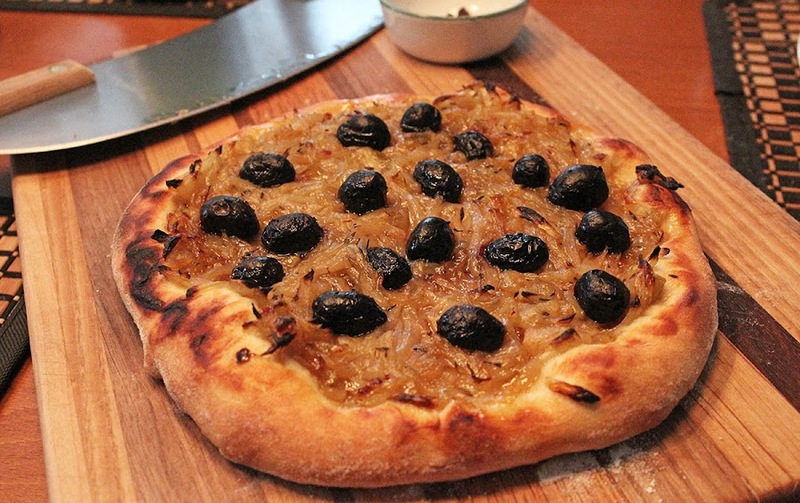 All you do is cook down a lot of onions with herbs and white wine (optional), then spread them on a pizza crust, dot with black olives, and bake. Follow it with a green salad and you've got a meal. Last week, Ken drove up to a local wine cooperative and, with his purchase, they gave him this promotional scratcher. It came with no instructions, no rules, and no indication of what the prize might be. 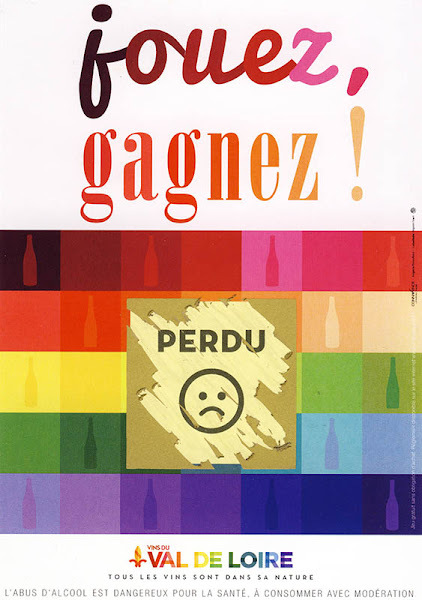 But how could I not be excited by the words jouez, gagnez ! (play, win!)? Not to mention the rainbow colors and little wine bottles. I grabbed a coin and rubbed off the golden, um, whatever that stuff is you rub off a scratcher. Perdu. Lost. Sad face. The teeny-tiny print on the right says there's a web site where you can find the game rules. I needed a magnifying glass to read it. After I lost, I noticed that I had scratched off the game piece in the shape of France. That's got to be worth something, n'est-ce pas ? 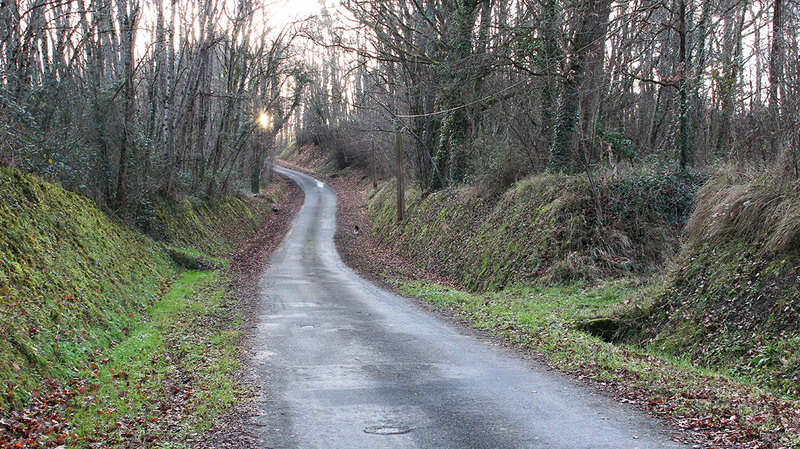 This is our road where it climbs up from the river to our house and the vineyards on the heights above. If you look closely, you can see Callie out ahead of me, on the right side of the road next to the first telephone pole. This is our usual afternoon route when the vineyard fence is not electrified. It's a circular route and Callie knows it well. 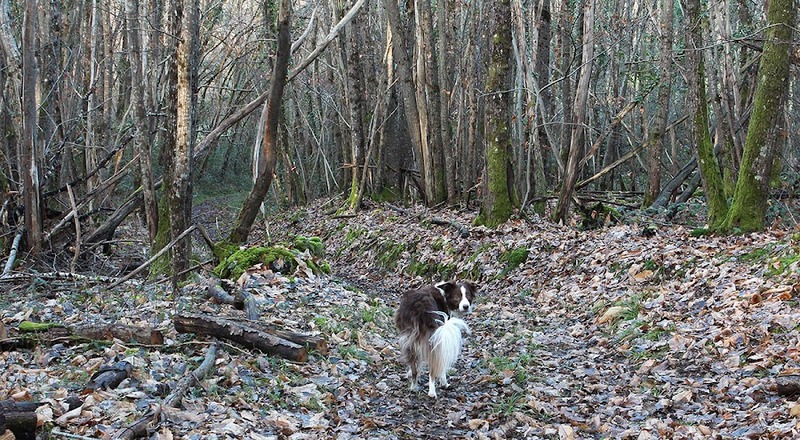 She knows that, with me, we turn left out the back gate in the mornings to walk through the vineyards, but we turn right out the back gate in the afternoons to take the path down the hill. Smart dog! The sun is setting as we head for home up the hill. The climb is good exercise for me. As for yesterday's sign mystery, I will be walking by it again this afternoon, so I'll have a closer look. I've been thinking it might say "Sable - oui." That would be "Sand - yes," which would make sense. I'll let you know. This home-made sign has seen better days. I saw it along one of my dog-walking routes last week. It's strange that I never noticed it before because it looks like it has been there for a while. 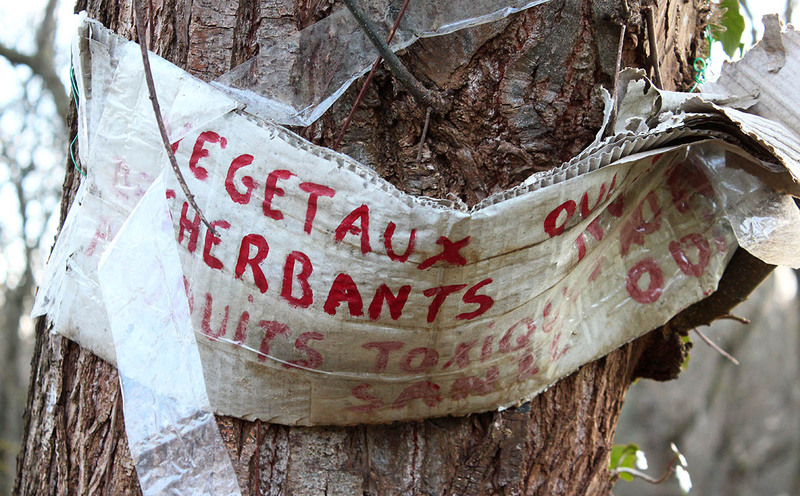 The sign is on a tree next to a stream bed where I've noticed the neighboring households dumping yard waste. I suppose whoever owns the property is concerned about pollution, and rightfully so. I can't make out that bottom line from my photo; I'll have to go back and take a closer look. We're still having just barely freezing temperatures in the morning, but the weather people are telling us we'll be warming up a little in the coming week. Battle of the bad-asses! 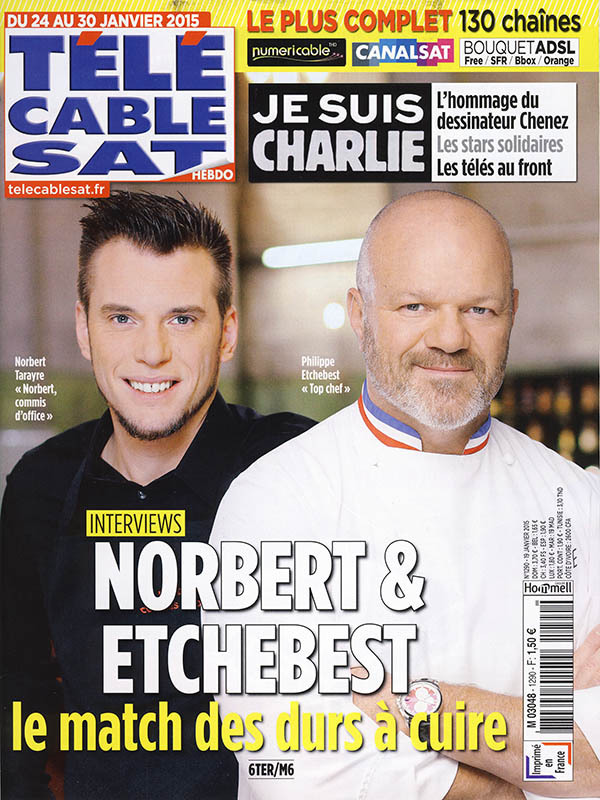 These two guys are apparently very popular personalities on television cooking shows. I haven't seen either of them, and I watch a lot of cooking shows. But I know why: I don't like "reality" or competition shows, especially when they involve cooking, and both of these guys do that kind of show. According to the article, Philippe Etchebest is a new panel member on Top Chef, a cooking competition. Norbert Tarayre hosts a new show where the invited guest prepares his or her favorite dish without knowing that his or her family and friends secretly hate it. Lovely. races against the clock, or opportunities to laugh at bad cooks. Right now I'm immersed in tennis and am not watching much else. There are close to ten hours of matches televised per day in the first week of a grand slam tournament. I watch the night session live from Melbourne in the morning, then switch over to the day sessions that I recorded overnight. It will all calm down next week as we get into the quarters, the semis, and the finals. Just a gratuitous shot of Callie in the woods. She was patiently waiting for me to finish taking pictures of the wood piles and cut trees on the path we often take down to the valley below. There was a lot to sniff and inspect, but she was still ready to move on before I was. Callie's ready to continue down the hill. Our nights continue to be cold and the sleeping is good. But it sure is hard to get out of the warm flannel sheets in the morning. I'm glad we have the central heating to get the house up to temperature each day. Having to build a new fire in the cold and dark every morning is not something I'd like to do. Of course, if that were necessary, I'd probably have a different kind of stove that would keep the fire smoldering over night so it would only need a few new logs to get it going again. I would have made a lousy pioneer. About five years ago we had a rather big storm that knocked quite a few trees over in the woods around us (and also in our yard). Several trees fell over the path that Callie and I take through the woods just to our north, the path that leads down into the river valley. Well, in last couple of weeks two guys have been out there clearing it up. They're cutting the downed trees into meter-long logs for burning and stacking them to dry. A view of the new clearing from the path, looking down toward the river valley. 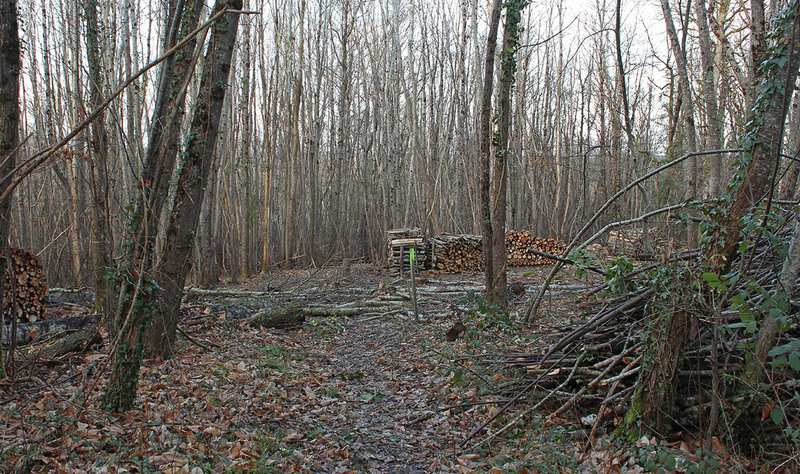 They're also cutting more than just the downed trees, making a huge clearing in the middle of the woods. I don't know if they guys doing this own the land, nor do I know why they're doing it now, so long after the trees came down. I do know that I'm happy not to have to crawl under and over those tree trunks when I walk down there. The leaning trees last April. They had actually fallen farther since, forcing me to climb over and under the trunks to get by. The second photo is from last spring. As time went on, the trees kept getting closer to the ground. And now they're history. 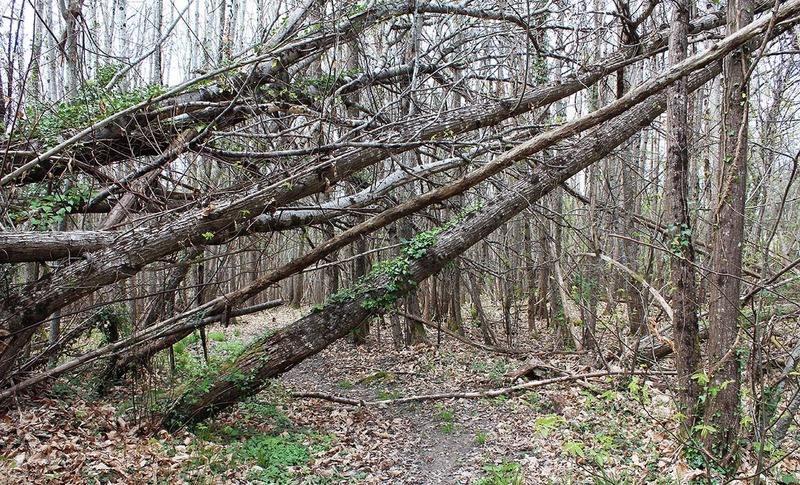 For comparison, the pair of trees on the right in the bottom photo are the same pair standing in the center-right of the top photo. I noticed a huge patch of perce-neige (snowdrops) the other day on one of my walks with Callie. It seems early, but it's probably not. Still, it surprised me to see them. This morning I will have to check our yard to see if any have come up here. We have one or two places where they come up, but nowhere near the size of patch you see here (which is only part of the huge patch I saw). 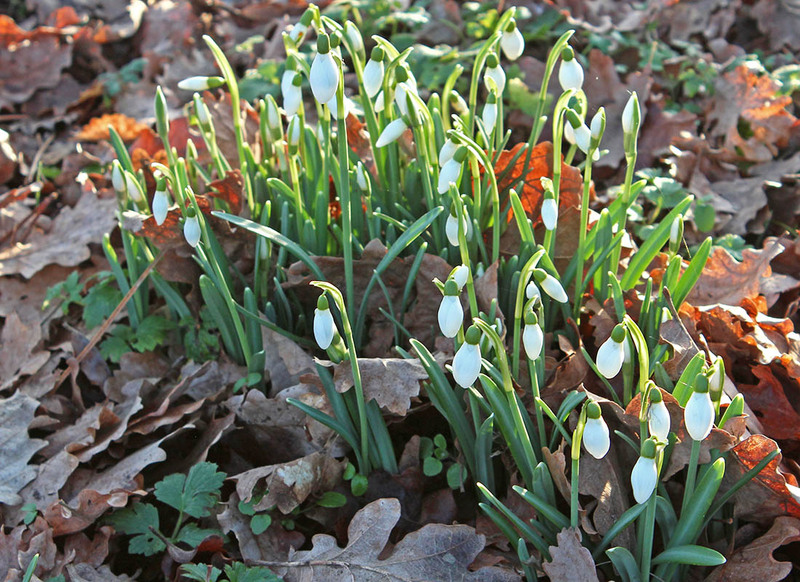 Without snow to poke up through, these snowdrops have to make do with fallen leaves. There's snow falling west of Tours this morning. It depends on which weather site is most accurate as to whether or not we will see some later as the system moves east. As usual, where we live is right on the line between snow and no snow. I'm betting on no snow. This morning the sky is clear and I can see Jupiter setting in the western sky. The temperature is just below freezing as it often is when the night sky is cloudless. We're expecting the chill to continue through the week, and that's a good thing. Normal winter weather. I'm glad to have a good supply of firewood. There's no snow in the forecast for us, however. The setting sun lit up this row of trees on Sunday afternoon. This row of pine trees borders a vineyard parcel just east of our house. It's the place where the land drops into the river valley. On this side you can see grape vines, on the other, there's a steep wooded slope. 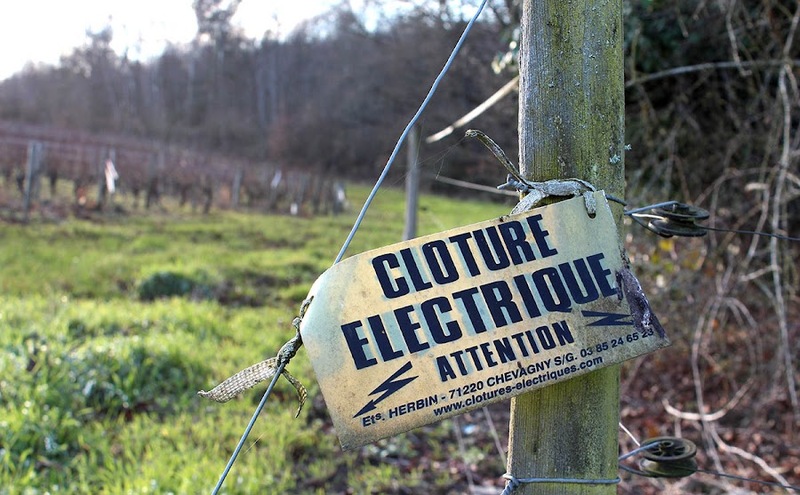 Many of the vineyard parcels around us, those that are adjacent to the wooded stream beds, are partially protected by electrified fences. 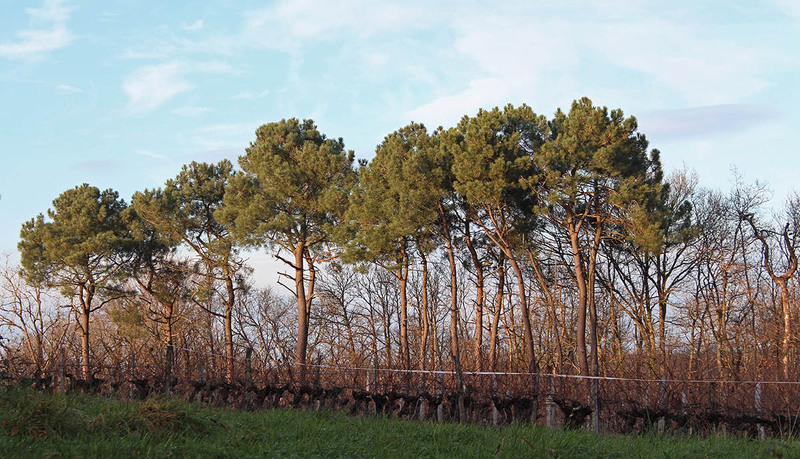 The fences make it more difficult for deer to enter the vineyard and munch on fresh vine shoots and grape flowers in the spring. The company that made this sign is located in Burgundy, quite a hike from here. The fences are not powered up except for those couple of months in the spring. Car batteries are the usual power source. This fence blocks one of the paths that Callie and I like to take on afternoon walks. Right now, and during the rest of the year when the power is off, the grower lowers the fence at the path's access point so that people can cross over safely. When the power's on, we find other places to stroll. 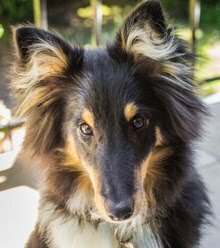 Callie encountered the electrified fences once or twice when she was a pup and has learned to keep clear of them. It won't seem cold to most who live in winter climes, and it's really not all that cold. Still, the prediction for the next few days is for mornings at or just below freezing, warming up just a few degrees during the days. They're saying on television that this is normal for us this time of year. 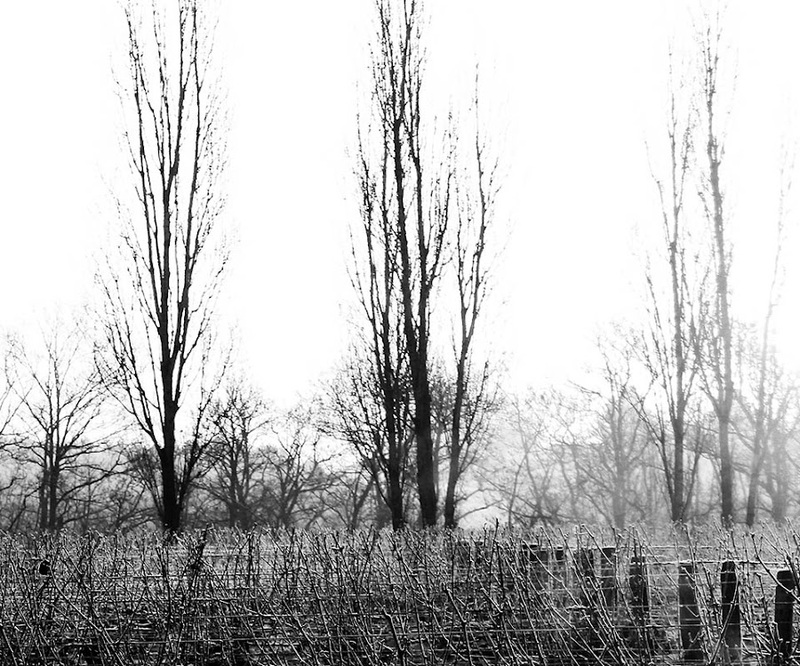 A recent sunrise in the frosty vineyard. 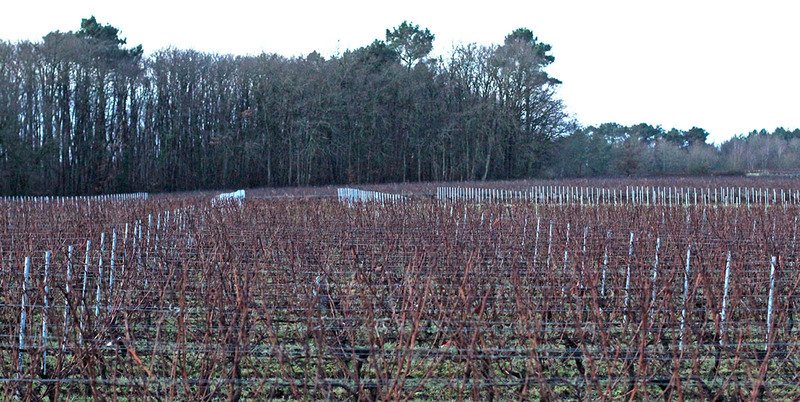 These vines have already been pruned. You may have noticed in the sidebar that the Australian Open is getting under way this week. I'll be recording and watching a lot of tennis over the next two weeks. I've already been watching the buildup to Melbourne since the season began earlier this month; Doha, Chennai, Auckland, and Sydney are some of the tournaments that I've seen parts of. I get whatever our satellite channels show. We don't have The Tennis Channel available here (in France, anyway). But we do get two golf channels. Really. Oh, and there's some (American) football on, too. Another week, another television guide. 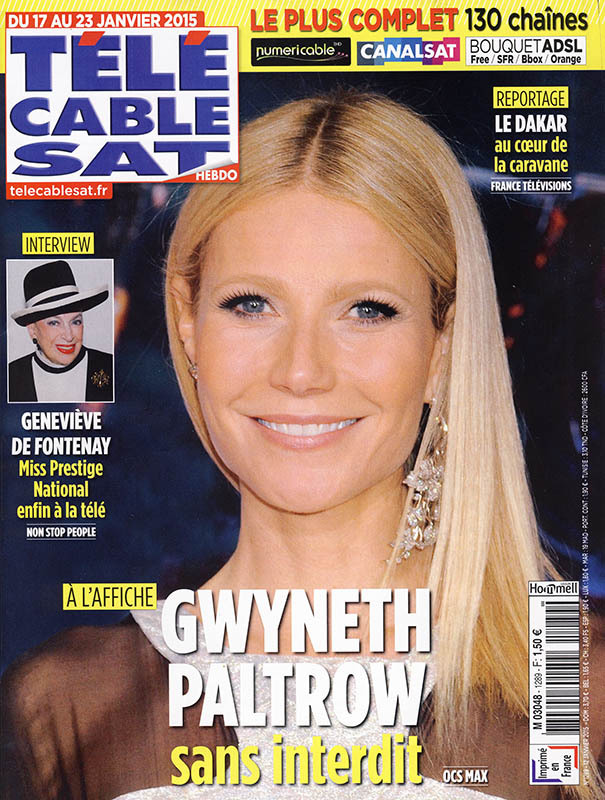 Gwyneth Paltrow graces this week's cover. I haven't read the article (I rarely do), so I don't know what she's up to, other than the teaser sans interdit which I take to mean a "no-holds-barred" or "nothing off limits" interview. Or, it could have something to do with whatever it is she's doing*. The woman in the hat in the small photo is an institution in France. She's Geneviève de Fontenay, long associated with the Miss France pageant. At 82 years old, and after a bumpy, scandal-ridden ride with the current owners of the pageant (she sold the enterprise that she and her late husband created to a corporation in 2002, but continued to run it), Madame de Fontenay is no longer part of the Miss France spectacle. She has broken off and created a new pageant called Miss Nationale and yet another called Miss Prestige National, which is now apparently going to be televised. Yawn. *Ok, I felt bad leaving you all hanging like that, so I actually went back and read the article. Well, some of it. Ms. Paltrow's new movie with Johnny Depp comes out in France this week. But the angle of the story is that, after 25 years of acting, and at the ripe old age of 42, Ms. Paltrow says that she's now open to everything. Nothing is "off limits" in her life any more, especially since separating from her rock-star husband. Now she's got time for other pursuits, like taking on more unusual acting roles and managing a web site. Oh, and spending more time with her children, Apple and Moses. Really. Apple? Moses? So let it be written, so let it be done! January always seems like the longest month, even if it's no longer than March, May, July, August, October, or December. Maybe it's the dark days, maybe it's that the string of holidays has run its course. Or maybe it's because February seems so short. Whatever. 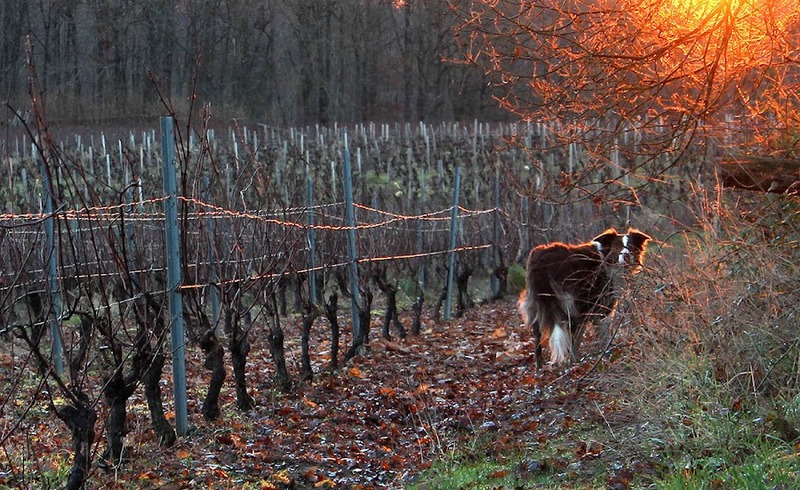 Callie at sunrise during a recent walk among the vines. Clouds may have silver linings; Callie has a golden lining. The weather people tell us that we're in for a few cold days. Chilly days, rather. I don't think we're expecting temperatures below freezing where we live. Here is Tuesday morning's sky again, this time in a much wider shot. I took this photo ten or fifteen minutes before the one from yesterday. The clouds are still pink and are much farther from the moon. The line was moving quickly toward the east as Callie and I made our way through the vineyard. The sky at sunrise on Tuesday morning. There's another jetliner heading south, to the left of and below the moon. The wind has been blowing for a few days now. This morning, it's pretty gusty and rain is predicted for most of the day. It should be a lovely walk. Tuesday morning's sky was dramatic. Big lines of clouds stretched across from one horizon to the other, separated by wide swaths of blue. 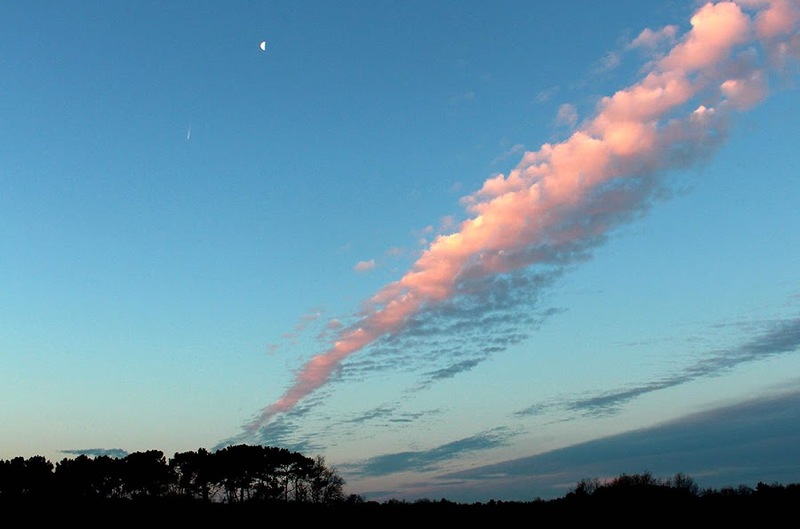 A waning moon was hidden, then revealed, as the cloud lines moved across the sky, hurried along by a stiff wind. Jetliners made their way against the current and their short contrails didn't last long. I almost missed this shot. By the time I got the camera's settings right, the moon and the jet were nearly behind the clouds. As the sun rose, the clouds lit up. Pale pink at first, then suddenly bright white on their eastern edges. It was quite a spectacle. It's starting. I can feel the days getting longer. Not so much in the morning, but in the evening, especially when the sky is clear, there is definitely more light. Last night it was still kind of light out at six o'clock. The metal stakes in the new vineyard parcel line up exactly with those in the older parcel in the foreground. We watched a documentary on television last night. It was one in a series about deserts, and the desert of the evening was the Mojave in the southwestern United States. Now, I usually have the highest praise for French documentaries. They're thoughtful, informative, well photographed, and not sensationalistic. In other words, boring. I like them like that. But whenever the French do a program that involves people in the United States or Canada, they seem to have a knack for finding the crazies. I looked up the program we saw last night and learned that it was actually produced by a German company. The Germans apparently share France's talent for seeking out and interviewing the loonies in America. In the Mojave desert, the filmmakers interviewed an old geezer who's life work has been to build a humungous gaudily painted rock sculpture dedicated to Jesus. Another woman told us she is a contractor at the airport where Virgin Galactic and other companies are trying to develop space flight vehicles. She loves her job because, through her, God is helping man get into space so he can be closer to heaven. A woman who once lived on an abandoned western-themed movie set told of the old German man who was holed up in, well, a hole under a rock. He frequently encountered visitors from other worlds, especially those from Venus, who taught him the secret to cell regeneration and eternal youth. He's dead now, she thinks. Then there was the woman, extremely pregnant, who recounted her close encounter with an alien in a white pickup truck. She never said who the father of her child might be, but I was expecting, well, you know. That's when we changed the channel. This was our sunrise on Sunday. The day was clear and bright with no clouds at all (after those morning clouds cleared off). It was a good day all over, which was nice for the massive demonstrations held in Paris and other cities around the nation. If you look closely, you can see three contrails made by jets heading south. It's now time for January outdoor chores. Because of our recent windy fronts, there are a lot of downed twigs and branches that need to be gathered up and set aside for kindling. I also have to prune the roses and the big hydrangea, and trim back the lavender bushes. Sometime between now and February, the garden contractor is coming back to prune two of our apple trees. The result will be smaller trees with fewer branches (and maybe fewer apples to fall on the ground), and that should allow more morning sunlight to shine on the vegetable garden this summer. 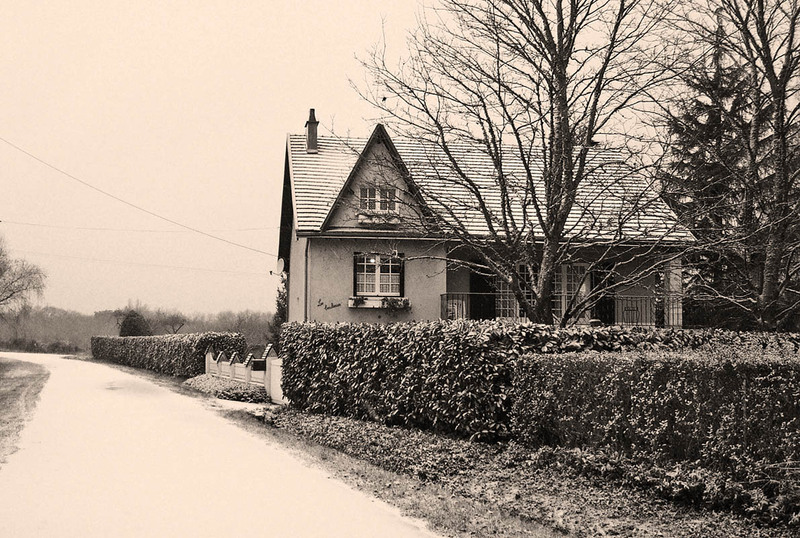 The first January we spent in this house was in 2004. It snowed on New Year's Day. It wasn't much, but having just come from nearly eighteen years in San Francisco, it was a little exciting. It has snowed again several times since, but not in recent years. A dusting of snow, January 2004. Curiously, that first summer, 2003, was one of the hottest on record in France. We haven't seen heat like that since then. Now we're having a string of unusually warm winters (and not so great summers). I'd gladly take some cold and snow if it meant we'd have a nice warm (dare I say hot?) summer. Certainly what was on television on Friday was pretty much non-stop coverage of the national police storming the two locations where gunmen were holding hostages. The two actions unfolded almost simultaneously late in the afternoon. You probably know the outcome, so I won't go into it here. 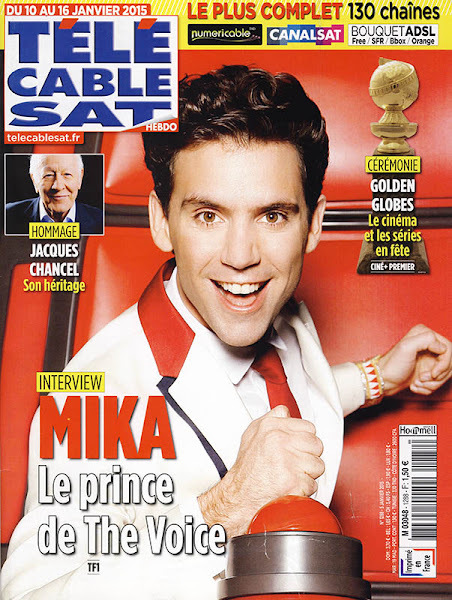 Mika is one of the current panelists on the talent/game show "The Voice" in France. Suffice to say that these events have been traumatic for the national psyche. As the shock subsides and the mourning ends, there will likely be much hand-wringing and politicking in the weeks and months to come. Maybe a little Mika is what we all need. Or, maybe not. After our appetizer of snails on Wednesday, we ate tomato soup. We thawed out some of our frozen tomato sauce, made from last year's crop, and added some herbs and aromatic vegetables (carrots, onion, and celery) and let it simmer for a while. Then Ken blitzed it all with the stick blender. 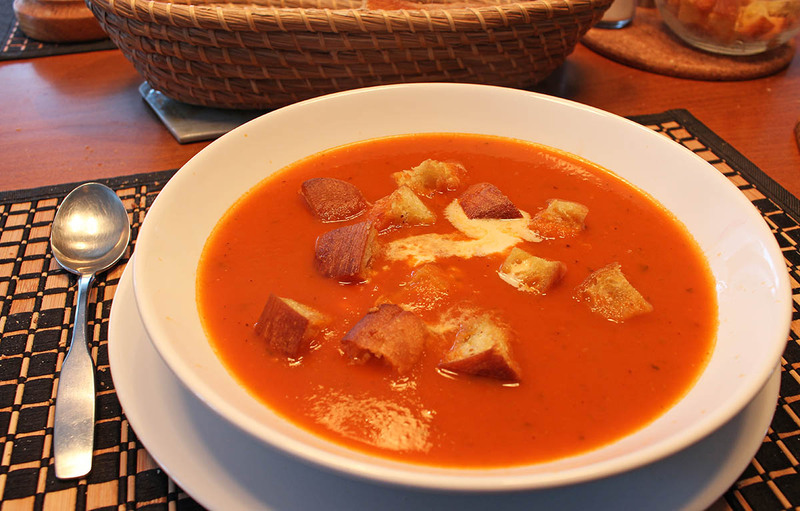 Home made cream of tomato soup with garlic croutons. The cream is in the middle and hasn't been stirred in yet. We served the soup with cream and garlic croutons, and it was so good that we ate it all. I'm sure that surprises you. 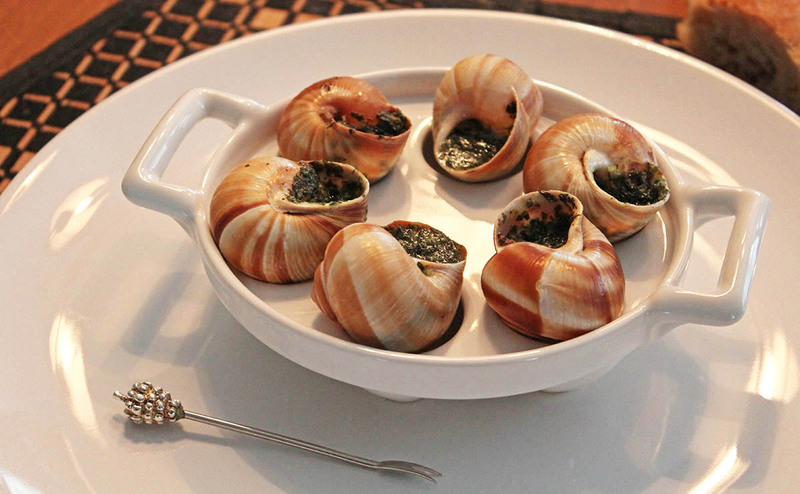 When our friend Christine visited last October, we made an appetizer of escargots (snails) in garlic and parsley butter. There were too many snails for the three of us, so I stuffed a dozen shells with the extras and froze them. Yesterday, we took them out and baked them as part of our lunch. Escargots in the shell with garlic- and parsley-flavored butter. You can buy these already made and frozen in the supermarket, but I made the butter and stuffed these myself. We already had the shells. They were delicious. Just as tender and tasty as the day they were made. Well, the garlic and parsley butter provides most of the taste. The first couple of times we had snails, they came already prepared and frozen from the supermarket. They were very good, and we saved the shells to use again. The snails we ate yesterday (and in October) were canned, which is why we had so many. I think there were three dozen in the can and we only ate two dozen back in October. So now that I know that canned snails freeze well, I won't be worried about buying them in quantity again. I made the traditional galette des rois (cake of the kings) on Tuesday. 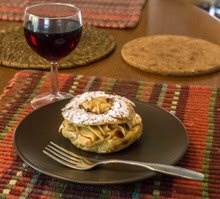 The puff pastry was good, but I was not all that happy with the way the cake rose; it came out a little lopsided. I think it was because I forgot to notch the edges of the cake as I usually do. No matter. It tasted perfectly delicious. The finished cake, well risen (one side more than the other) and nicely brown and crisp. The technique is not complicated. I cut my block of puff pastry in two, then rolled out the first one. I used a dinner plate to cut out a circle of dough. 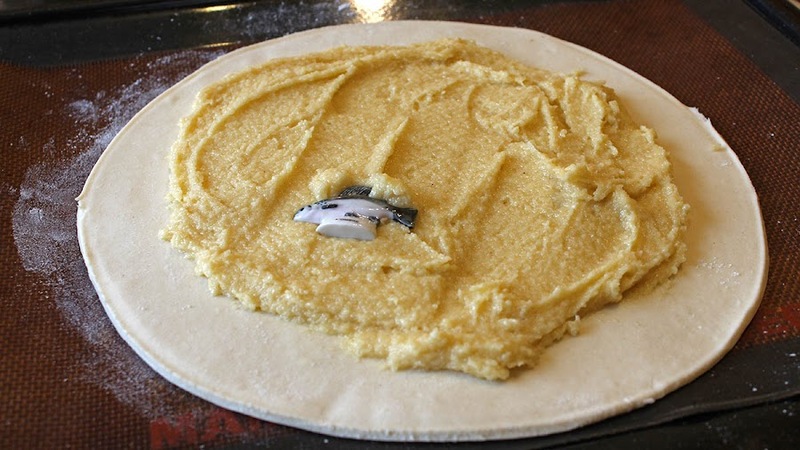 Then I spread the almond cream (a mixture of ground almonds, butter, sugar, and an egg) in the center of the circle. I placed the fève into the almond cream at one edge. This year's fève (literally "fava bean" but nowadays it refers to the little prize inside the cake) is a ceramic fresh-water salmon called un omble. The little ceramic fish came from a commercially made galette many years ago. 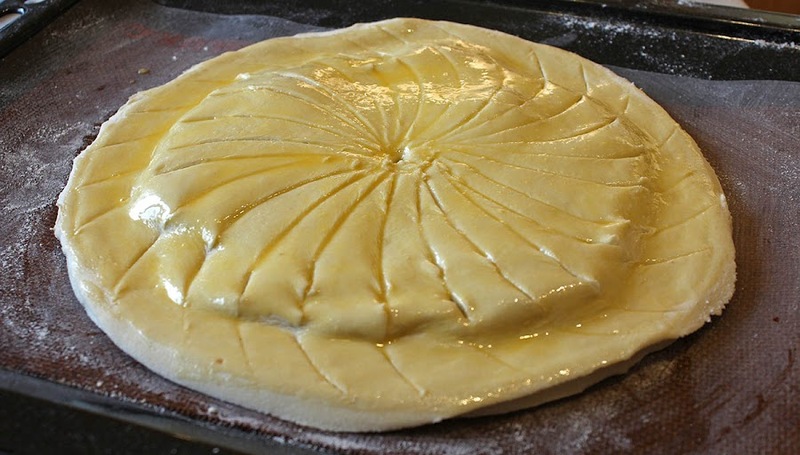 I rolled the second block of pastry out, cut another circle, and laid it over the first, having first painted some beaten egg around the edge to seal it all. Next, I used a knife to cut a pattern into the top of the cake. It was at this point that I should have used the knife to make little notches all around the edges of the cake, but I forgot. I then painted the top of the cake with more beaten egg before putting it into a hot oven for 20 to 30 minutes. The assembled cake ready for the oven. It would easily serve six people. As I said, the cake puffed up a little more on one side than the other, even though I turned it around halfway through the baking. Oh well, stuff happens. It tasted great, and Ken got the prize in his slice. He was king for the day! Yesterday. The combination of short days and foggy mornings and/or rainy afternoons has made it difficult to take pictures on my walks with the dog lately. I took this one, like the last one, last week on New Year's Day when we had clear skies and frost. It wasn't a great photo, so I stylized it a little with Photoshop. A winter scene in black and white. 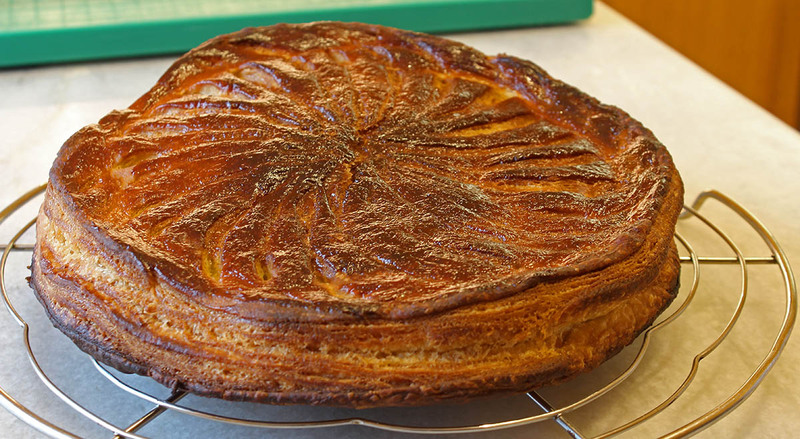 Today is the epiphany, or twelfth night, so we will eat our galette des rois (cake of the kings) for dessert. I made the puff pastry (flaky pastry) on Sunday and it's ready to go. I'll make the frangipane (almond cream) filling and bake the cake today. Hey, a photo op! Unfortunately. They've calmed down a little since the fall. I wonder if they hibernate. Because our summer was wet, the moles had an easy time digging their tunnels in our yard and finding plenty of worms and insect larvae to feast on. When the summer is dry, they move down the hill toward the stream beds in search of moister places. 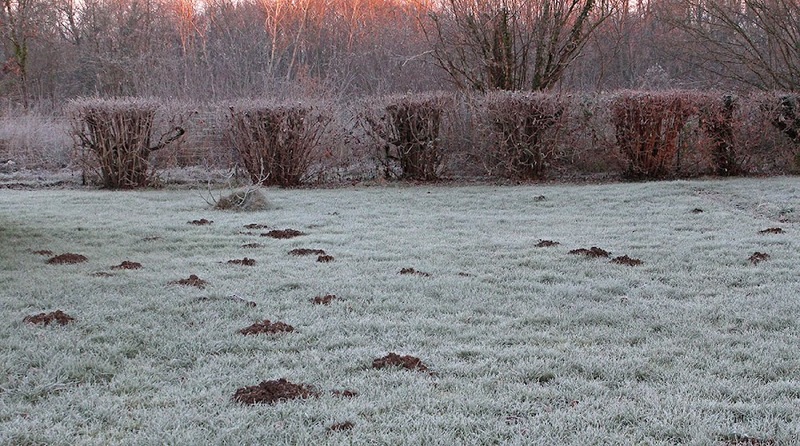 Mole hills in one section of grass between the garden shed and the vegetable plots. I have a lot of mole hills to eradicate this spring before I cut the grass for the first time. I will shovel some of the dirt into the wheelbarrow and use it to fill in low spots. Otherwise I will rake it onto the surrounding ground. The worst part is the tunnel network, just below the surface of the grass, that makes the ground spongy. And I've learned in recent years that cats do not like (to eat) moles. Just our luck. Our frosty weather is behind us for the moment. Things have shifted around and now we're back to relatively warm and wet. And muddy. Yuck. Such is the nature of a temperate climate. This photo is from New Year's Day, just last week. This time of year, I prefer frozen ground to the squishy, muddy stuff we have now. While we haven't really had rain, we are having a very heavy drizzle that is, at times, driven horizontal by the wind. It's not pleasant to walk in and it gets Callie nearly as wet as actual rain. Yesterday morning, as we made our way back to the house, I heard cats growling in the neighbor's yard. On inspection, I saw Bert rolling around with another cat under a tree. Callie went after them and they ran. I found Bert in the neighbor's driveway a few minutes later and almost had him when Callie came bounding back. Needless to say, Bert ran again. He came back home shortly after and took a long morning nap. 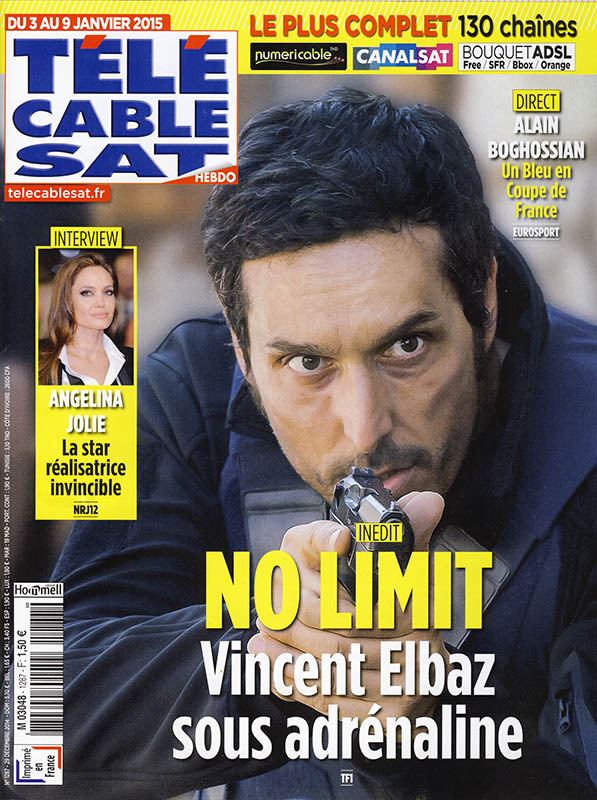 Here's the cover of this week's television program, at least the one that I subscribe to. Nothing earth-shattering here. I think television is trying to get back into a normal pattern now that the big holidays are over. Today Ken and I are going to the annual mayor's New Year speech in town. She will briefly review the past year's events and talk about what's coming up this year. It's also a chance to see and be seen and to raise a glass of local bubbly to our fellow townspeople, which is remarkable because I cannot imagine any American municipality or government body providing alcohol at a meeting. The French are so much less hung up about such things. New Year's Day was one of those nice winter days that is cold, but clear and brilliantly sunny. 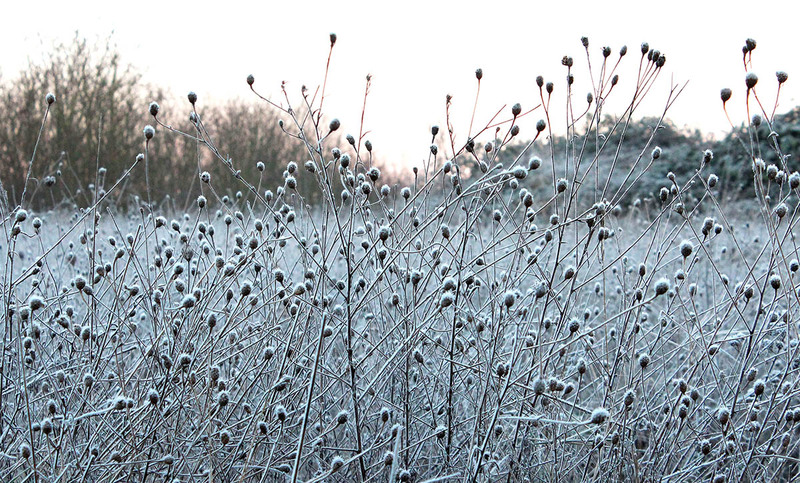 When I went out with Callie just before sunrise, most everything shone silvery thanks to a light layer of frost. The puddles in the road were all frozen as were the muddy spots, so Callie didn't get dirty. 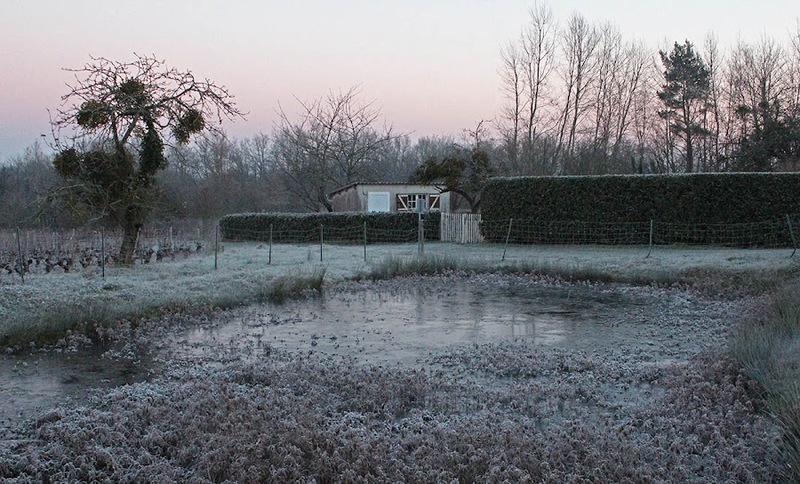 And the pond outside out back gate had frozen over in the night. The pond is choked by jussie (ludwigia), but there are still some open spots where you can see the ice. The layer of ice on the pond was certainly very thin and wouldn't support much, maybe a small bird at most. Still, the freeze was welcome. The lady that delivers bread in the morning greeted me with a smile on Wednesday. "Ça fait du bien," she said (It feels good!). The weather is changing today and it won't be as cold. We could use a few more freezes before spring. We'll see. 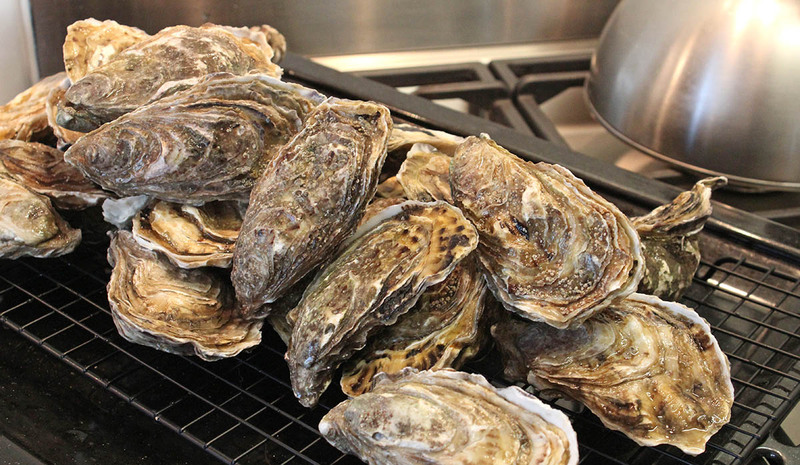 Among the traditions practiced during le réveillon de la Saint-Sylvestre (New Year's Eve) in France is the eating of huîtres (oysters). I'll bet that the largest sales of oysters in the nation happen during the end-of-year holiday celebrations. Ken and I did our part, getting two dozen oysters for our New Year's Eve meal, along with a mess of shrimp. My home-made cocktail rye bread, without caraway seeds. I will make this again. Oysters are traditionally eaten raw, on the half shell, with une sauce mignonette (vinegar, shallot, and black pepper) or lemon. Along with them you will often have small slices of rye bread spread with butter. 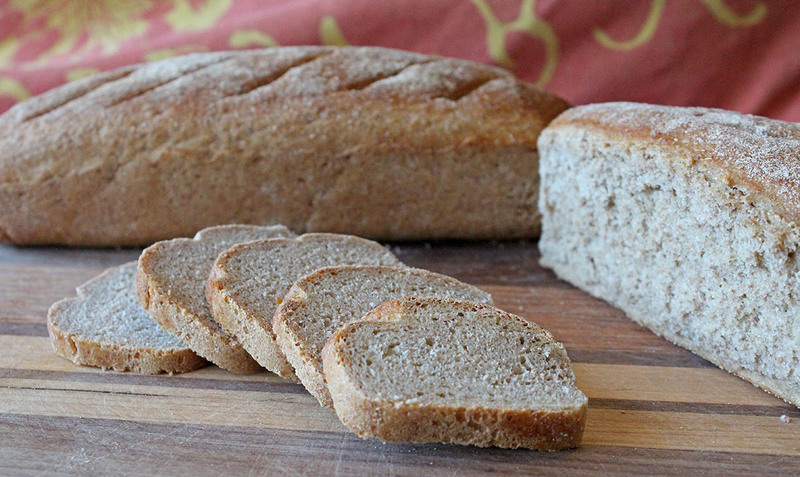 I had some rye flour in the house, so I decided to make my own rye bread. It worked out well, and we gobbled most of it up with our oysters and shrimp. Fresh oysters, ready for steaming, or just opening and eating as they are. We cheated a little with the oysters and opened them by lightly steaming them in a hot oven. They come out not quite raw, but also not quite cooked. They were delicious, and a lot easier to open than raw oysters. We ate the shrimp with a basil-flavored mayonnaise. I didn't take any photos of those, but they were very tasty. Today we will have our traditional New Year's Day meal of black-eyed peas made in the style of a southwestern French cassoulet, with duck confit, sausages, and pork.